As I think you’ll agree, only that second line really matters. It makes this car huge. Only a handful of Indianapolis 500 winning race cars are in private hands (that won prior to 1996). Rutherford started 25th, battled with A.J. Foyt for 50 laps and then took off, lapping every car on track with the exception of second place Bobby Unser – who finished 22 seconds behind J.R. That’s a beast of a race car and driver. The M16C was introduced in 1973. This was a McLaren-factory car campaigned for the entire USAC season with Rutherford behind the wheel (Peter Revson was his teammate). This car won the pole at Indy in ’73. It was slightly redesigned for ’74 and Rutherford had to wait until Bump Day to make the field. 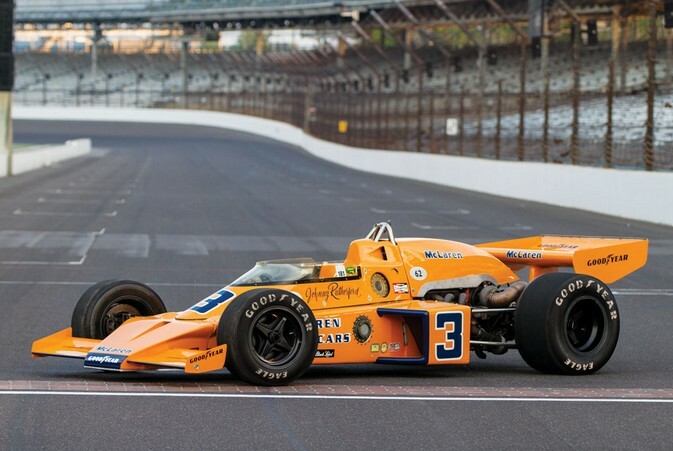 This car was sold by McLaren to a privateer team, who failed to qualify for the 500 with it in 1977 and 1978. When it was restored later on, the car was reverted to as it was in victory lane in 1974. It changed hands for a record price in 1991 and has been used (by Rutherford) at the Goodwood Festival of Speed. The engine is a 2.6-liter turbocharged Offenhauser straight-four making 800 horsepower. That’s more than current Indy cars. At any rate, it’s rare that a 500 winner can be bought. This one should sell for between $1,250,000-$1,750,000. Click here for more info and here for more from RM in Monterey. This entry was posted in Uncategorized and tagged 1974, auctions, cars, indy 500, m16c, mclaren, racecars, rm auctions by classiccarweekly. Bookmark the permalink.